Being a food blogger is great. I get to try out new recipes on a regular basis, my fridge is perpetually stocked, and I always have leftovers. I am literally never hungry. But the food blogging life has its downsides. For instance, I am always trying out new recipes, so I rarely get to make the same dish more than once or twice. But, this Instant Pot Butternut Squash Lentil Curry was so good and so easy to make that not only did I make it more than once, I made it three times in just two weeks. Let’s talk about why I love this curry so much. First, it has a low-effort, high-reward ratio. Thanks to the Instant Pot, there’s just 5ish minutes of hands-on cooking involved, so it’s one of those meals you can easily throw together on a weeknight. Once you sauté the aromatics for a few minutes, you can just toss everything in the Instant Pot and let the machine do its pressure cooking magic. If being able to prepare a delicious, healthy, and crowd-pleasing dinner on a weeknight with minimal work isn’t motivation enough to finally buy an Instant Pot, I don’t know what is. Oh, did I mention that it makes for fabulous leftovers? Another reason I love this curry so much is that it is incredibly flavorful (just as any good curry should be) but has a fairly minimal ingredient list and is made wit commonly available ingredients you likely already have in your pantry. Another selling point: this curry is creamy and hearty AF, making it the perfect winter comfort food. 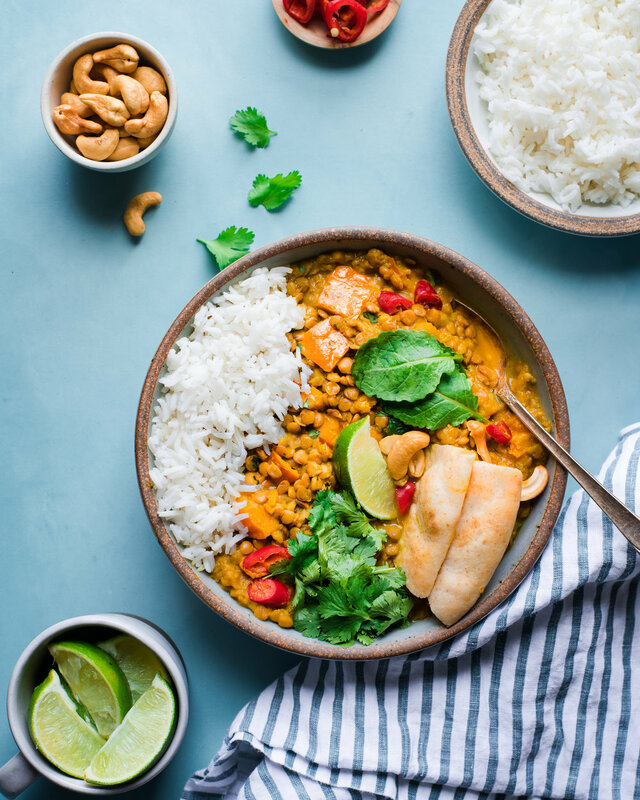 The Instant Pot magically transforms plain old lentils into creamy morsels bathing in a velvety stew made of coconut milk and cashew butter. But to keep this curry on the lighter side, I opted for “lite” coconut milk instead of the full-fat variety. While you can definitely use the full-fat variety, I find that “lite” coconut milk is sufficient to yield a rich, creamy texture. As for cashew butter? No, it’s not a traditional ingredient in curries, but it does add a nice, rich creaminess, just like almond butter does in my Red Lentil Curry, which you all love so much. This curry, however, isn’t just indulgent comfort food. This is the kind of comfort food that will nourish your soul and your body. This butternut squash lentil curry starts with anti-inflammatory powerhouses ginger and turmeric, then gets a healthy dose of vitamin-rich butternut squash, followed by heart-healthy lentils and cashew butter, and finally a generous sprinkling of antioxidant-rich kale. A few notes on substitutions. I use whole cumin seeds because I love the aroma and extra depth of flavor that whole spices bring to a curry, but if you don’t have cumin seeds, you can just use the same amount of ground cumin and add it along with the turmeric and curry powder (skip the first step). If you can find fresh turmeric (Whole Foods usually stocks it), that would make this curry even better. Grate or mince 1 1/2 tablespoons of the fresh stuff, and add it along with the garlic and ginger. Regarding butternut squash, you can use any winter squash you like, such as kabocha squash or red kuri squash. Red kuri squash, also known as hokkaido pumpkin, makes the prep work even easier because you don’t have to peel the skin. And if you’re having trouble finding cashew butter, just substitute almond butter (peanut butter has a much stronger taste and might be overwhelming in this curry). That’s all there is to say about this easy Instant Pot Butternut Squash Lentil Curry, so I hope you give it a try and enjoy it! Select the Sauté setting on the Instant Pot and after a few minutes, add 1/2 tablespoon of the coconut oil, followed by the cumin seeds. Toss for 30-60 seconds until lightly browned and very fragrant. Add the remaining 1 tablespoon oil, followed by the onion and 1/2 teaspoon of the kosher salt. Cook the onion for 4-5 minutes until lightly browned. Then add the garlic and ginger and cook for 1 minute, stirring frequently to prevent sticking. Stir in the the curry powder, turmeric, and cayenne (if using) for 30 seconds, adding the 2 tbsp water to prevent the mixture from drying out too much. Add the chopped butternut squash and stir to coat it in the spice mixture. Pour in the vegetable broth and use a wooden spoon or spatula to scrape up any browned bits at the bottom of the pan. Then add the remaining 1 teaspoon kosher salt, the lentils, coconut milk, and cashew butter. Select the Cancel setting. Secure the Instant Pot lid and set the Pressure Release to Sealing. Select the Pressure Cook or Manual setting and set the cook time for 10 minutes. Once the timer goes off, allow a natural pressure release. Once the pressure has released, open the pot and stir in the baby kale. Select the Sauté setting and heat for about 2 minutes or until the kale has wilted, then select Cancel. Add the lemon or lime juice and the cilantro and stir to combine. Serve the butternut squash lentil curry over white rice or with flatbread. Heat a deep, heavy skillet or a Dutch oven over medium-high heat. Add 1/2 tablespoon of the coconut oil, and once hot, add the cumin seeds and fry for 30-60 seconds until lightly browned and very fragrant. Add the onions and cook until they are translucent, about 5 minutes. Then add the garlic and ginger and cook for 1-2 minutes until lightly golden and fragrant. Stir in the curry powder, turmeric, and cayenne (if using) until well incorporated. Add the butternut squash, vegetable broth, lentils, coconut milk, and cashew butter. Stir well to combine. Bring the curry mixture to a boil, then reduce the heat, and simmer for about 30 minutes, until the lentils are tender and the squash is cooked through, stirring every few minutes. Add the baby kale and allow to cook for 1-2 minutes until wilted. Add the lemon or lime juice and the cilantro and stir to combine.